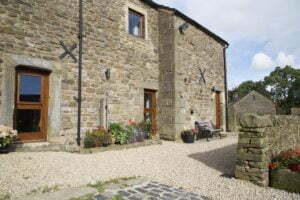 Nab View Bunkhouse is a recently converted 18th century barn. Situated on Ollerbrook Farm, it’s a beautiful conversion that provides comfortable and spacious accommodation for a group of up to 18 people. Nab View Bunkhouse has three ground floor bedrooms, a four-cubicle shower room and two toilets. Upstairs, the spacious open-beamed living space has stunning views across to Kinder Scout. There is an ample and comfortable lounge area, together with a dining area and self catering kitchen separated by a breakfast bar. The kitchen is well stocked with utensils and equipment, including a large fridge and a freezer. There is ample outside sitting area to the rear of the bunkhouse, suitable for BBQ. There is a no smoking policy within the bunkhouse. Sorry – no pets. 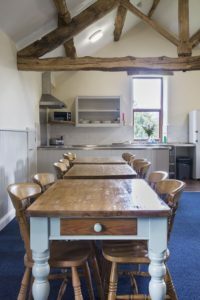 Nab View Bunkhouse offers ideal accommodation for groups who wish to stay together under one roof in a tranquil and beautiful setting, with scope for a wide range of activities on the doorstep. It is also possible to book the barn for non-exclusive use at £20.00 per person, although you must be in a party of 6 or more. The bunkhouse has the capacity to sleep 18 people. There are three bedrooms each sleeping six people. Each bunk has a mattress with fitted sheet and a pillow with pillow case. Please bring your own sleeping bag and personal towels.